The global economic recovery since the 2008 crash has failed to reach all levels of society and inequality continues to grow, according to a major report. Credit Suisse said the world had been growing more equal from the start of the century until 2008. “The trend reversed after the financial crisis”, its report notes however, and while the most recent data is only provisional it looks set to continue to get more unequal. Overall, it said wealth inequality was a major issue “in almost every part of the world”. 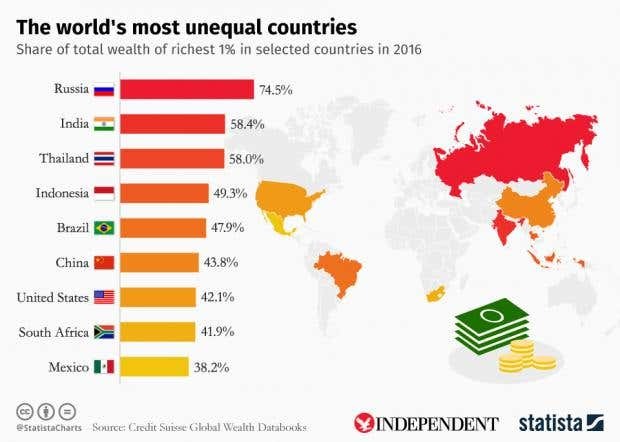 “Our estimates suggest that the lower half of the global population collectively owns less than 1 per cent of global wealth, while the richest 10 per cent of adults own 89 per cent of all wealth, with the top 1 per cent accounting for half of all global assets,” the report notes. Since its report last year, Credit Suisse identified the US and Japan as the biggest earners in the world in terms of improving household wealth, while Switzerland was once again named the richest country per capita. And the biggest loser? Thanks to the Brexit vote and the subsequent crash in value of the pound, the UK was ranked as suffering the worst losses in household wealth in the world in the last year. Credit Suisse estimates that the decision to leave the EU wiped £1.5 trillion from Britain’s collective wealth, and saw the number of US dollar millionaires in the country fall by 406,000. The next biggest loser on this metric, Switzerland, was down just 58,000.